Fast-Fold Truss Deluxe frame and legs are constructed of sturdy 2-1/2" wide by 1-1/4" thick aluminum tubing and feature easy release latches for simple, quick set up and tear down of the screen. Available with Da-Mat, Da-Tex (rear), Cinema Vision, Pearlescent and Dual Vision, all Fast-Fold Truss Deluxe surfaces are interchangeable with Fast-Fold Truss surfaces for easy substitution. 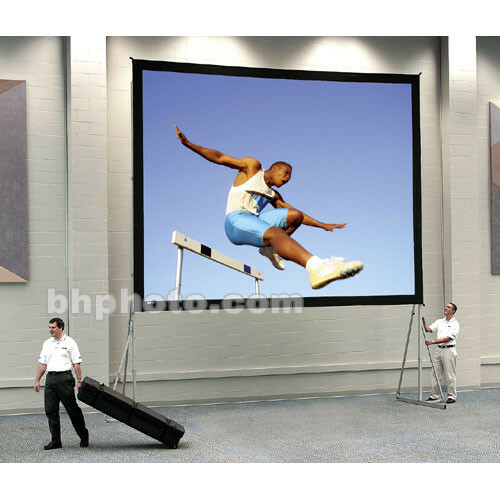 Complete screen also includes a rugged carrying case with wheels and is available in sizes from 7x9' up to 19x25'.